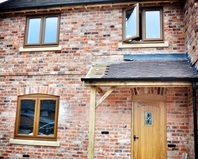 Window Wise PVCu windows use the most technically advanced in the market. Designed to meet the highest possible energy rating standards (WER ‘A’ rated), they are completely lead-free and fully recyclable. Not only that, our windows are amongst the most secure that money can buy. Fully accredited to meet UK standards, including the police-backed 'Secured By Design' programme, our range assures the safety of your home. With a choice of styles and a huge range of colours available, including standard White, Cream, Rosewood, Light-Oak and Irish Oak. along with a range of bespoke colours including Grey, Black and Chartwell Green, there’s a window to suit every building – from traditional farmhouse to contemporary loft as well as commercial and new build. Energy Plus Range: For even more thermal efficiency, Window Wise's top of the range Energy Plus profile has additional chambers to prevent cold air from the outside getting into your home and is available across the whole Liniar range.